Falls City was founded in 1857, its early history part of the sweeping social and political changes overtaking a divided nation. The area was the Nebraska base on the Lane Trail, through which free-state immigrants were directed to Kansas. At that time, Kansas Territory was in the throes of a bloody struggle between the pro-slave and anti-slave settlers. James Lane, a free-soil leader, believed that the beautiful Nemaha Valley offered great agricultural opportunities and believed that a location on the Nemaha falls also had industrial potential. The first residents were Dave and Anne Dorrington, abolitionists who were said to have assisted John Brown on his travels through the settlement. After Archer, Richardson County\'s first county seat, was found to be within the \"Half-Breed Tract,\" a sometimes violent rivalry ensued between Falls City and neighboring Salem, over the new location of the Courthouse. Falls City won the seat designation in an 1860 election. Today Falls City is the hub in a four-state corner -- Nebraska, Kansas, Missouri, and Iowa. Included within a radius of approximately 100 miles are the great cities of Omaha, Lincoln, Kansas City, St. Joseph, and Topeka, as well as numerous smaller cities. Ideally located, Falls City serves as a distribution center for this growing region. The Courthouse is listed on the National Register of Historic Places, and the Prichard Auditorium which was built in 1938 houses a variety of community events. Falls City is a very active community with nearly 100 social and civic organizations. Many of the brotherhood organizations have a long history within this area. There are more than a dozen churches, with many mainstream denominations founded between 1857 and 1900. Falls Citians are proud of their heritage and are working to make their community a memorial to the past and a guidepost to the future. The Veteran's Memorial Monument is located on the southeast side of the courthouse lawn, and is a tribute to Richardson County men who were killed in World War II, the Korean Conflict, and the Vietnam War. 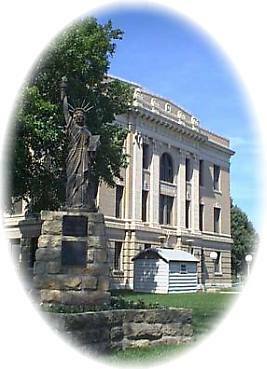 The Richardson County Military History Museum is located in the east entrance of the Richardson County Courthouse, in Falls City, Nebraska. This museum is dedicated to preserving the rich military history of those men and women who served our nation.